View More In Remote Controls. This remote is compatible only with the models listed above. No additional programming is required. The remote provides most of the original commands for your device. It is guaranteed to turn the device on and off, give access to and navigate the menu, choose input signal. Some specific functions, such as page flip, keystone correction, video adjustment and numbers are normally available but in rare cases may not work properly with some devices. No laser pointer is available. Remote requires two AAA batteries (not included). 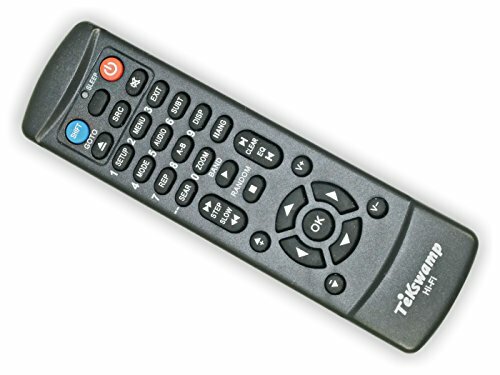 Tekswamp remote features comfortable, easy to reach buttons in a compact, rectangular body, convenient for everyday use and transportation. Electrical circuit of the remote control requires little power to operate. It will continue to operate even when the batteries are close to their life's end. ON Indicator lights up after any active button on the remote has been pressed. It indicates that the remote works properly and that it sends an IR signal to the device. Remote is manufactured from strong durable plastic and will not break easily. Buttons are comfortable but not overly-sensitive to touch. This feature prevents them from wearing out or sending accidental signals. Security Screw is a childproofing feature that prevents unauthorized access to the small parts inside and the choking hazards associated with them. If you have any questions about this product by Tekswamp, contact us by completing and submitting the form below. If you are looking for a specif part number, please include it with your message.